On May 10, 1968 , a newborn golden palomino colt was born. This colt was the product of years of experimental crossbreeding to produce a large pony around 14 hands in height with Arabian type and smooth saddle gaits. In the Fall of 1968, the American Walking Pony Registry was established with the breed's founder, Joan Hudson Brown serving as Executive Secretary. Registration number 1 went to Browntree's Flicka, a mare instrumental in the development of the breed. BT Golden Splendor was assigned number 5 and is the first stallion registered in the breed. After the American Walking Pony was featured in articles in various horse magazines, horse breeders from around the world expressed interest in purchasing breeding stock. The foundation cross that produced the American Walking Pony was the Reg. Tennessee Walking Horse and the Reg. Welsh Pony. The Walking Horse contributed the smooth saddle gait and the Welsh, the lovely head and long arched neck. Ponies of various bloodlines of this cross were accepted for registration. The unique gaits of the American Walking Pony are the Pleasure Walk, the Merry Walk and the Canter. They can also trot as well. In reality, the breed is a seven gaited horse comparable to Roan Allen, a Champion Walking Horse who also exhibited and won in the Fine Harness Division and Five Gaited Division, as well. The Walking Pony, one of America's most versatile breeds has jumping capability inherited from the Welsh Pony and is highly successful at open shows as a Pony Hunter. In 1981, Leslie Klein of Rancho Mirage, California, rode her Reg. American Walking Pony, Orchid's Minuet to win a National Championship Competitive Trail Junior Division. Proving the versatility of the breed, BT Golden Flair in the early 1960's, was a Champion Five Gaited Pony. He was sold as a five year old to a family with several children who rode him for pleasure and showed him in open Pleasure Classes. In his old age, with little re-training, he competed in Open Western Pleasure Junior Riders at the walk, jog trot and lope, winning against Arabians and Quarter Horses. In 1982, at age 24, shown by his owner, Tammy King, Flair won Youth Western Pleasure and came back into the ring in the American Walking Pony breed class and placed second behind Golden Splendor. The Walking Pony gaits are inherited and the recommended training procedure is as follows: After the pony has been lounged, fitted with a snaffle and line driven for several weeks, he can then be mounted first with someone holding him from the ground. After he is lead about and then ridden on a long line while the rider teaches him to respond to the snaffle to stop and turn, then the rider can take him on alone teaching him body pressure, pressing with the legs encouraging him to go forward. After the pony is responding to the snaffle and obeying the rider, the bit can be changed to a curb bit with a low port, 4 3/4" mouthpiece and no longer than 7-inch cheek. A leather-chin strap is preferable during training. When the pony is walking and reining correctly, then he should be pushed into a faster walk by leg pressure or tapping with the heel. 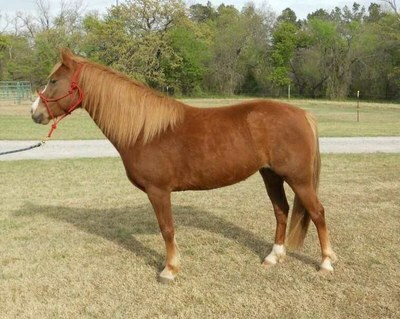 Pull the reins lightly and squeeze with the legs at the same time to collect the pony and get his back legs under him. Each day, try to increase the speed more. 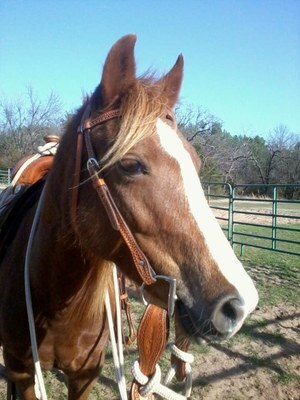 The pony should be going at an easy to ride gait which is the Pleasure Walk. It is faster than a walk and comfortable to ride. Should the Pony want to trot, it may become necessary to pull one rein and the other simultaneously and swing in the saddle from side to side. This is to get the pony off balance to get him started in his pleasure walk. The Merry Walk is faster in the same cadence with little head motion. After the Pleasure Walk an Merry Walk are perfected, training can be advanced to the Canter. The easiest way probably is to begin from the Pleasure Walk, to the Merry Walk and keep squeezing or kicking if necessary, until he breaks into a canter. After he canters fast for a few minutes, use slight rein pressure to slow him down a little at a time. After a few minutes, stop him and walk for awhile. If the pony seems nervous, talk to him and pet him until he calms down. Every time you ask him to canter pull his head slightly toward the rail and encourage him to take the lead to the inside of the ring. Kicking him behind the saddle next to the rail as you pull him slightly toward the rail is the best Canter signal as the judge cannot see your signal. After the pony is performing well on the rail at the canter, begin working him in smaller circles as this help to slow his canter and teach balance. Visit a Walking Pony breeder and ride a walking pony, and experience that feeling of lightness and smoothness that you have never before known. It is unique to the breed, truly "A DREAM WALKING". American Walking Pony Association, P.O. Box 5282, Macon, Georgia, 31208. Phone: (912) 743-2321. We are currently searching for additional photographs, slides or video of this breed. If you have visual material which we could borrow or if you know of a potential source please contact us using the comment form below.